To analyze changes in corneal densitometry 3 months after accelerated corneal collagen cross-linking (CXL) measured with Scheimpflug tomography. 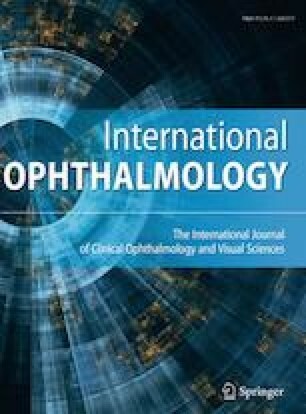 In this study we reviewed charts and anterior segment data of patients who had undergone accelerated pulsed epithelium-off CXL (30 mW/cm2 for 4 min, 8 min total radiation time) for treatment of progressive keratoconus in the Department of Ophthalmology, Goethe University, Frankfurt, Germany. Visual, topographic, pachymetric and densitometric data were extracted before surgery and at the 3-month follow-up. Corneal densitometry measurements from different corneal layers and zones obtained using Scheimpflug tomography (Pentacam HR, Oculus). The study investigated 12 eyes of 12 patients. The anterior (120 μm) stromal layer within the 0.0 to 2.0 mm and 2.0 to 6.0 mm concentric zones showed a significant elevation of mean densitometry 3 months post-surgery (P = 0.045; P = 0.015) compared to baseline. A mean stromal demarcation line was apparent at a depth of 203.00 μm ± 13.53 (SD). After accelerated CXL, no change in mean corrected distance visual acuity (LogMAR) was observed but a thinning of the cornea measured by a significant reduction in central pachymetry (μm). Accelerated CXL results in an increase in corneal densitometry, particularly in the anterior stromal layer within the two central concentric zones (0.0 to 2.0 mm and 2.0 to 6.0 mm) of the cornea at 3 months postoperatively. The changes in corneal densitometry of the anterior stromal layer did not correlate with postoperative visual acuity or central pachymetry. Thomas Kohnen has received research grants from Hoya Surgical Optics GmbH (Frankfurt, Germany); J&J Vision (Abbott Medical Optics, Inc. [Santa Ana, CA, USA]); Novartis (Alcon Laboratories, Inc. [Fort Worth, TX, USA]); Oculentis GmbH (Berlin, Germany); Oculus Optikgerate GmbH (Wetzlar, Germany); Schwind Eye-Tech Solutions GmbH (Kleinostheim, Germany); and Carl Zeiss Meditec AG (Jena, Germany); and is a consultant to Geuder AG (Heidelberg, Germany); J&J Vision (Abbott Medical Optics, Inc. [Santa Ana, CA, USA]); Novartis (Alcon Laboratories, Inc. [Fort Worth, TX, USA]); Oculus Optikgeräte GmbH (Wetzlar, Germany); Santen GmbH, (Munich, Germany); Schwind Eye-Tech Solutions GmbH (Kleinostheim, Germany); STAAR Surgical AG (Nidau, Switzerland); TearLab Corp (San Diego, CA, USA); Thea Pharma GmbH (Berlin, Germany); Thieme Compliance GmbH (Erlangen, Germany); Ziemer Ophthalmology GmbH (Emmendingen, Germany); and Carl Zeiss Meditec AG (Jena, Germany). Myriam Böhm: none; Mehdi Shajari: Oculus; Matthias Remy: Avedro Inc.: Travel has been funded; Thomas Kohnen receives grant support from Hoya, J&J Vision (Abbott), Novartis (Alcon), Oculentis, Oculus, Schwind, and Zeiss; and is a consultant to Geuder, J&J Vision (Abbott), Novartis (Alcon), Oculus, Santen, Schwind, STAAR, TearLab, Thea Pharma, Thieme Compliance, Ziemer, and Zeiss. Myriam Böhm and Mehdi Shajari declare that they have no conflict of interest. Matthias Remy has received a travel honorarium from Avedro (Waltham, MA 02451, USA). This article does not contain any studies with animals performed by any of the authors. All procedures performed in studies involving human participants were in accordance with the ethical standards of the institutional and/or national research committee and with the 1964 Declaration of Helsinki and its later amendments or comparable ethical standards. No informed consent was obtained from patients since this was a retrospective study and data were anonymized. This is in accordance with the ethical vote obtained from the local ethics committee.